One of the wonderful things about the San Diego area is that big blue thing just to our west. Not only is it our playground, it is also the source of an amazing – and amazingly varied – bounty. The fish tacos for which San Diego and Baja (where the thing was invented) are known are a nod to that. But, as I’ve documented elsewhere (http://sdfoodtravel.com/san-diego-seared-ahi-tuna-tacos-with-chipotle-crema-and-mango-salsa-fresca/), I am not exactly the fish taco’s biggest fan. In fact, over time I’ve come to realize that I tend to like seafood – and particularly fish – best when it is served as close to its swimming state as possible. It is not just sushi that I’m talking about: it is just about any tasty fish. Cooking has the tendency to rob fish of its vibrancy and, to some extent, its unique identity. 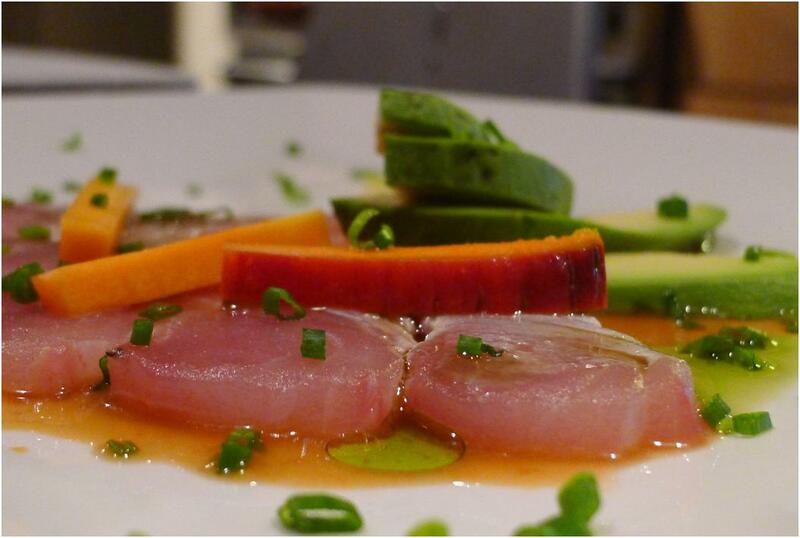 Yellowtail, one of the best local fish, is a great example of that. Cooked, it can seem like a strongly flavored tuna (though its not actually a tuna at all). Raw, it is glorious. Another wonderful thing about the San Diego area is our greatest fruit: the avocado. I grew up in the East County of San Diego amidst one of the greatest Fuerte Avocado groves in the world (indeed, the street I grew up on directly connected Fuerte Drive to Avocado Boulevard). While many believe that Hass Avocadoes are “the best” I personally believe it depends in large part on the time of year. For the first half of most years the Fuertes (the green, smooth skinned variety) are richer, creamier and offer a beguiling sweetness. 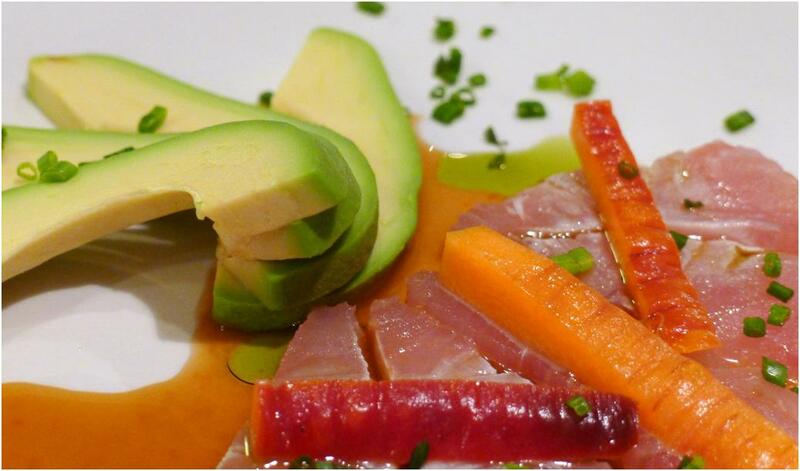 This dish is designed – in the Baja Med way – to highlight these two wonderful local products, yellowtail and avocado. Make the Carrot Pickles. Place the carrots slices in a glass or non-reactive bowl and cover with boiling water for one minute before draining. Place the remaining ingredients in another large glass or non-reactive bowl and whisk to combine the solids and the vinegar. Add the drained vegetables to the bowl and let stand for one to two hours. Store in a refrigerator. Make the Tomato Lime Sauce. Combine the ingredients in a saucepan and bring to a boil over high heat. Reduce the heat to low and simmer for half an hour. Prep the Hamachi. Using an extremely sharp knife, trim away the bloodlines from the yellowtail and cut it into two (or more) evenly shaped blocks from which you will cut vaguely sashimi-like slices. It is less important precisely what the ultimate shape of the slices will be than that they all be the same. Slice the Hamachi into individual slices of no more than ¼ inch each. The best way to do this is, somewhat counterintuitively, to slice away from your body rather than towards it. Try to use one knife stroke for each cut. Prep the Avocado. Slice an avocado in half, lengthwise and remove the pit (one good way to do this is to strike the business end of a chef’s knife lightly into the top of the pit and slightly twist…it will pop out). Peel the skin off the avocado using your hands but being careful not to overly ruffle the flesh. Cut the avocado halves into attractive slices. Heat the Avocado oil. Put about ¼ cup in a small saucepan and heat it over a hot flame. Bring it just shy of the smoking point. When you just barely begin to see convection waves forming in the oil, you are done. Plate the Dish. Pour some of the Tomato Lime Sauce on the base of a plate. Arrange four slices of the avocado on the plate in a rising fan on one side of the plate. Lay out the Hamachi on the other side of the plate, side by side. Spoon some of the hot avocado oil over the Hamachi to just sear it ever so slightly. Arrange three to four of the pickled julienne carrots on top of the Hamachi. Garnish the plate with the chopped chives.